Like paths? Got your lines twisted in a bunch? Take a look at my 2014 Pi Day art that folds Pi. 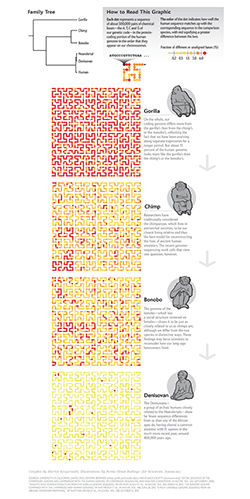 I collaborated with Scientific American to create a data graphic for the September 2014 issue. The graphic compared the genomes of the Denisovan, bonobo, chimp and gorilla, showing how our own genomes are almost identical to the Denisovan and closer to that of the bonobo and chimp than the gorilla. Here you'll find Hilbert curve art, a introduction to Hilbertonians, the creatures that live on the curve, an explanation of the Scientific American graphic and downloadable SVG/EPS Hilbert curve files. The graphic won a Bronze medal at Malofiej 23. Art direction by Jen Christiansen. Text by Kate Wong. Spot illustrations by Portia Sloan Rollings. ▲ Scientific American | Tiny genetic differences between humans and other primates pervade the genome. Art direction by Jen Christiansen. Text by Kate Wong. Spot illustrations by Portia Sloan Rollings. This page accompanies my blog post at Scientific American, which itself accompanies the figure in the magazine. In the blog post I argue that the genome is not a blueprint—a common metaphor that doesn't leave room for appreciating the complexity of the genome—and talk about the process of creating the figure. The graphic shows the differences between the genome sequence of human and each of Denisovan, chimp, bonobo and gorilla. Differences are measured by the fraction of bases in the gene regions of human sequence that do not align to the other genome. The approximately 1 Gb of sequence of gene regions (most introns are included) is divided into 2,047 bins which are mapped onto the Hilbert curve as circles. The color of the circle, which represents about 500 kb of sequence, encodes the fraction of unaligned bases. The original color scheme submitted for production was derived from the yellow-orange-red Brewer palette. The approach taken by the graphic is one of the simplest—this is why it was chosen. It's easy to understand and easy to explain. On the other hand, the answer depends on the state of the sequence resources for each species (especially bonobo, whose sequence assembly is in version 1) and completely overlooks the functional implications of these differences. The real goal of identifying differences, a relatively superficial problem, is to find the subset of differences that make a difference, which is a deep problem. Spitting images are identical within spitting error. For example, if someone told you that Vancouver, Canada and Sydney, Australia were 85% similar, you would likely assume that (a) this metric isn't that useful to you unless it aligns to your priorities in how city similarities should be judged, (b) other metrics would give different answers, and (c) some parts of Sydney are nothing like Vancouver while others might be identical. This goes the same for genomes, except that cities are easier to figure out since we built them ourselves. The differences will be scattered throughout the genome and will take many forms: single base changes, small insertions or deletions, inversions, copy number changes, and so on. In parts critical to basic cell function we expect no differences (e.g. insulin gene exons) while in genes that are rapidly evolving we expect to see some differences. A comparison of protein coding genes reveals approximately 500 genes showing accelerated evolution on each of the gorilla, human and chimpanzee lineages, and evidence for parallel acceleration, particularly of genes involved in hearing. — Insights into hominid evolution from the gorilla genome sequence by Scally et al. Parts of the genome that don't impact function are going to accumulate differences at a background rate of mutation. Any single-number statistic that compares two genomes is necessarily going to be a gross approximation. Such numerical measures should be taken as a starting point and at best as some kind of average that hides all of the texture in the data. Statements like "the 1% difference" are incomplete because they do not incorporate an uncertainty. If you see four separate reports claiming a 1%, 2%, 5% and 7% difference, this does not necessarily mean that we cannot agree. It means that the error in our measurement is large. You might venture a guess that the answer is somewhere in the range 1–7% (at the very least). While confidence intervals and error bars are a sine qua non in physical sciences, assessing uncertainty in life sciences is a lot more difficult. To assess the extent of biological variation, which will add to the uncertainty in our result, we need to collecting data from independent biological samples. Often this is too expensive or not practical. To provide a sober and practical guide to statistics for the busy biologist, Naomi Altman and myself write the Points of Significance column in Nature Methods. These kinds of resources are needed as long as errors persist in the translation between statistical analysis and conclusions (e.g. `5 sigma` and P values). Two compatible estimates can easily and wrongly be interpreted as incompatible facts. We don't yet have a full handle on individual levels of genomic variation, especially for non-human primates for which we have a single and incomplete genome. Even for humans, although we have resources like dbSNP, which catalogue individual variation, it is common to use the canonical human reference sequence for analysis. This reference sequence is only a single instance of a human genome (in fact, parts of it are derived from different individuals). As a result, many of the reported values (and certainly almost all that make it to popular media) are without any confidence limits and thus are likely to be interpreted as fact rather than as an estimate. This causes all sorts of problems—two compatible estimates can easily (but wrongly) be interpreted as incompatible facts. As an example, look at the phylogenetic trees in the figure below. Without incorporating uncertainty, the top tree presents a fixed and deceptive state of what we know about the uncertainty in what we know. Recent work has shed some light on the uncertainty in determining population split times. The two trees in the figure above are generated from the data in the table below, from Langergraber KE, Prufer K, Rowney C et al. 2012 Generation times in wild chimpanzees and gorillas suggest earlier divergence times in great ape and human evolution Proc Natl Acad Sci U S A 109 (39) 15716-15721. 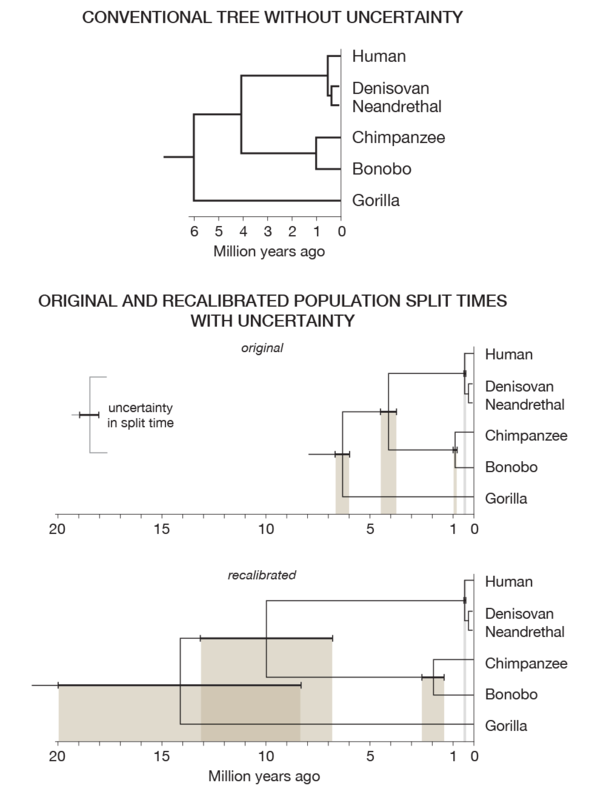 Notice that the human/chimp/gorilla split time uncertainty overlaps the human/chimp split. The addition of uncertainty is the inevitable consequence of making multiple measurements and upgraded analytical models. It is a blessing not a curse. That our genome is "similar" to that of the chimp, bonobo and gorilla is not in dispute. How to classify and quantify the differences is an active field of research, a process that often looks like a dispute. We do science so that our minds are changed. We have been sequencing quickly and cheaply for less than 10 years. It's amazing how much we've been able to understand in such a short period of time. Genome sequencing (or some kind of genotyping) is now routinely done in the treatment of cancer. It is not long before a medical diagnosis will include an assessment of the full genome sequence. As we sequence more and reflect more, we expect to change our minds. In fact, this is why we do science: so that our minds are changed. Scientists engage the public in the process of scientific inquiry, testing and observation by way of reports in popular science media and newspapers. Understanding these reports requires that one holds as a core value to process of science and its outcomes. Groups with different agendas and a fundamentally different epistemology hijaack observations such as "In 30% of the genome, gorilla is closer to human or chimpanzee than the latter are to each other." (from the gorilla sequence paper) in an attempt to argue that our evolutionary models are sinfully wrong. They don't understand the implications of the uncertainty in our measurements (e.g. phylogenetic tree figure above) and have world outlooks that are impervious to the impact of observation. It is certain that these genomes hold more surprises for us, but not in the way these groups claim. Is our science incomplete? Absolutely. How do we address this? We do more science. 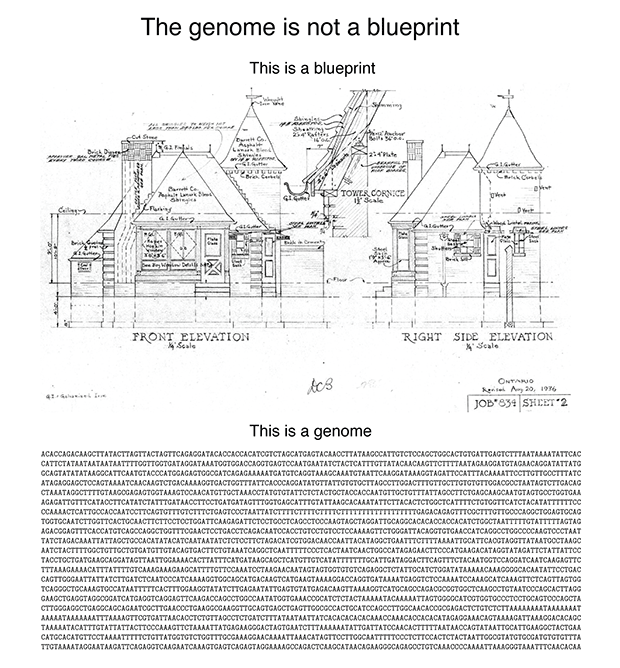 The genome is not blueprint. It's also absolutely not a recipe, which is promulgated by people who agree that it is not a blueprint. I explain my view of this here and why I think these analogies have disasterous effects on the public understanding of how their genomes (i.e. their bodies) work. Sometimes metaphors are wonderful and they help expand our mind. Other times they are like jailors, keeping us from having productive thoughts. You might argue that "blueprint" is one of the closest words in meaning, so its use is justified. The trouble is that its actually very far in meaning. ▲ The genome is not a blueprint and you should never say that it is. You shouldn't even say that it's like one, because it's nothing like one. A blueprint shows you "what". A genome doesn’t encode "what". It doesn’t even encode “how”. Nor does it encode "from what". It encodes "with what", which is several degrees removed from "what". I promise that this will make sense shortly. The reason why the blueprint analogy is pernicious is that it makes it sound like once the genome sequence is known, the rest easily follows. The reality is that these days the genome sequence is easily determined and the rest follows with great effort (or never) (see The $1,000 genome, the $100,000 analysis? by Elaine Mardis). I'm going to try to motivate you that the analogy is false by an example. Suppose that you wanted to build a house but instead of getting blueprints from the architect, you received this strange drawing. You’d be right to be confused—welcome to genome science. 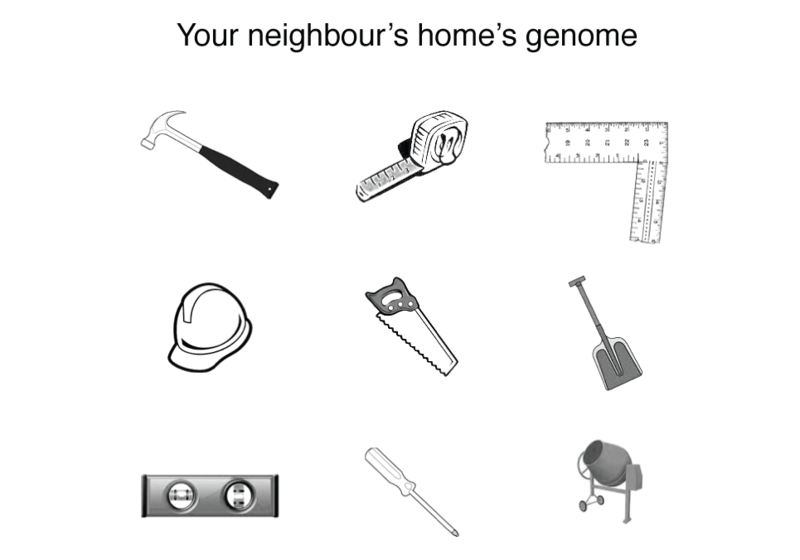 This house’s genome looks a lot like a set of tools and bears no resemblance to the house itself. The genome tells you nothing about (a) what the function of each tool is, (b) the effect of the tools form to its function (e.g. what are the many ways in which a hammer can diverge from its original shape before it ceases to be useful), (c) what the tools act on (this is why above I said "with what" rather than "from what"), (d) how the tools act together, and importantly (e) what the tools are used to build. This is more of a way a genome works. It encodes the protein enzymes that make biochemical reactions possible at room temperature. 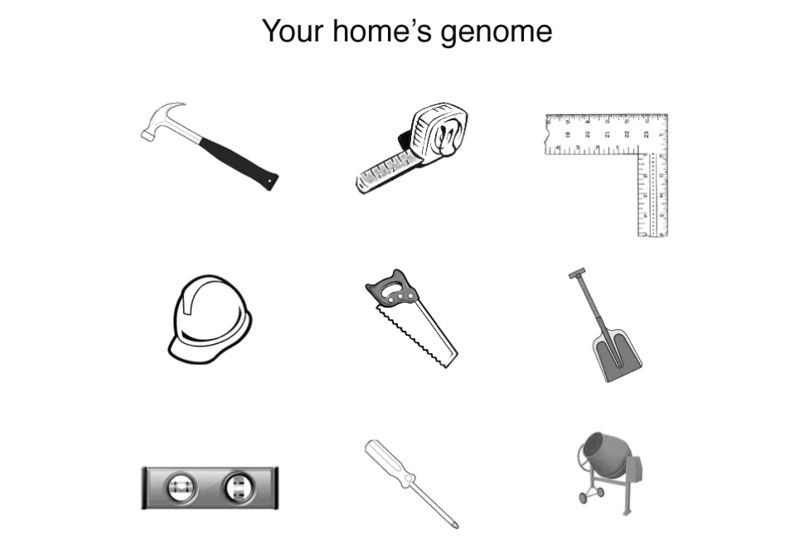 In the house example, the tools encoded by the genome (e.g. saw, hammer) can be thought of automatically doing their job when they’re in the presence of the correct material (wood, nail). This is in analogy to enzymes, which mediate reactions when in physical proximity of chemical substrates. The genome is not a code of life. It is a code of tools. Neither wood nor nails—both essential materials for construction—appear anywhere in your home's genome. This directly translates into a biochemical example. We use sugar as a source of energy but the genome hints nothing at this—it only encodes the enzymes that act on sugar. Things are made more complex by the fact that the function of an enzyme is essentially impossible to predict without additional information, such as knowledge of functions of enzymes with similar characteristics. You can probably imagine that the effect of changes in the home's genome is extraordinary difficult to predict. The figure below extends our example to that of your neighbour, which was recently observed to have collapsed. I’ll leave you to work out the mystery yourself. ▲ Why exactly did your neighbour's home fall down? You suspect the root cause lies in its genome. So next time someone says that the genome is a blueprint, or that it is the "code of life", point out that it is merely the "code of tools" for life, which is the emerging property of a set of chemicals confined within a physical space. The use of the Hilbert curve in genomics is not new. It appeared on the cover of Science in 2009 in connection to the 3-dimensional packing of the genome. It is an order 5 curve and just a flip of the curve I use in the Scientific American graphic. Here the corners of the curve have been smoothed out to give it a more organic and gooey feel. 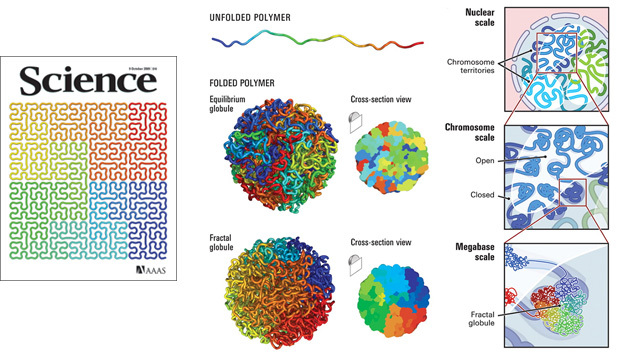 ▲ (left) Hilbert curve on cover of Science (Oct 2009) (right) Portion of Figure 2 from accompanying article Comprehensive Mapping of Long-Range Interactions Reveals Folding Principles of the Human Genome. At least one tool exists (HilbertVis) that allows you to wrap genomic data onto the curve. 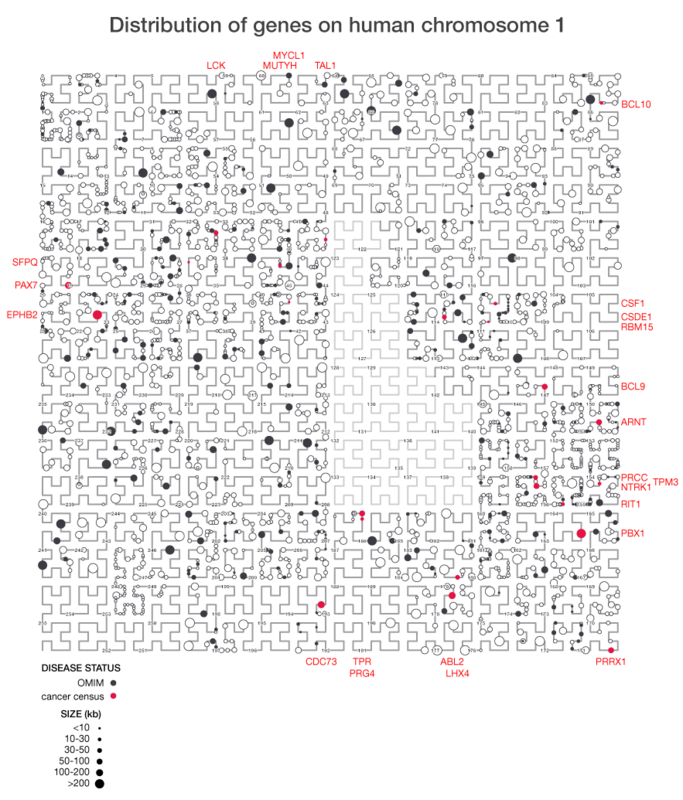 Anders S 2009 Visualization of genomic data with the Hilbert curve Bioinformatics 25 (10) 1231-1235. I've used the Hilbert curve before to show the organization of genes in the genome. This figure shows the chromosome at a much higher resolution than would be possible if an ordinary line was used. Because the Hilbert curve stretches the line into a square, it increases our ability to see details in data at higher resolution. In the figure below you can see distinct clumpiness in the organization of genes on the chromsome that is not representative of a purely random sampling. Except for the Denisovan, the net alignments (e.g. human vs chimp net) from UCSC Genome browser were used for the analysis. Gaps were intersected with human gene regions. For each gene, the region between the start of the first coding region and end of the last coding region was used. The RefSeq gene annotation from the UCSC Genome table browser was used. The union of all 51,010 RefSeq gene records was used. The gene region was taken as the extent of the gene's coding sequence (CDS), not just the exons within it. This record's contribution was the region 32890597-32972907, shown in bold above. The total size of the union of tx regions is 1.28 Gb (20,722 coverage elements), of cds regions as defined above is 0.99 Gb (24,931 coverage elements) and of exons is 74.5 Mb (225,404 coverage elements). International Human Genome Sequencing Consortium 2004 Finishing the euchromatic sequence of the human genome Nature 431 (7011) 931-945. 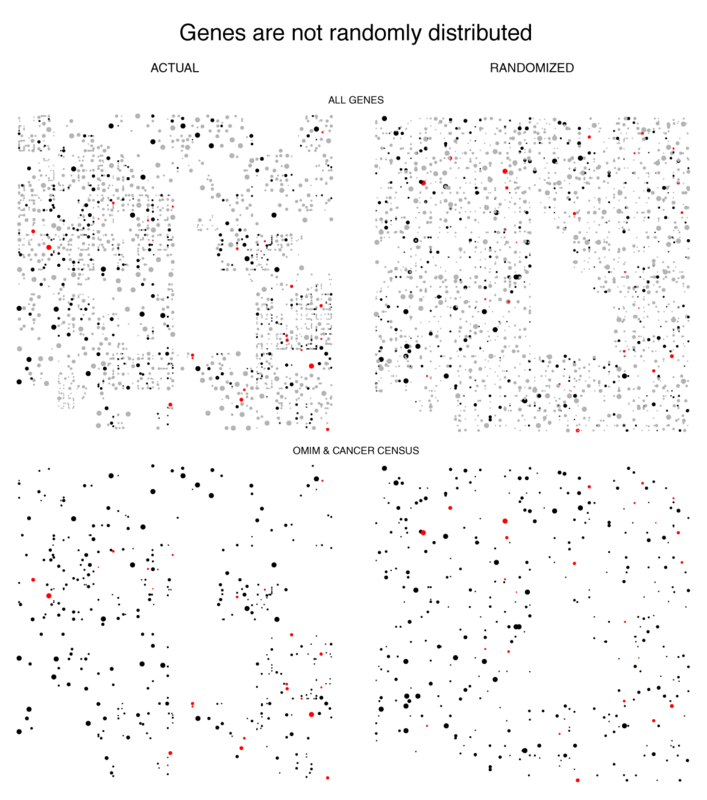 30x sequence was aligned to the human genome at Max Planck (data portal). Meyer M, Kircher M, Gansauge MT et al. 2012 A high-coverage genome sequence from an archaic Denisovan individual Science 338 (6104) 222-226. Chimpanzee Sequencing and Analysis Consortium 2005 Initial sequence of the chimpanzee genome and comparison with the human genome Nature 437 (7055) 69-87. Assembly version: May 2012 (panPan1). Prufer K, Munch K, Hellmann I et al. 2012 The bonobo genome compared with the chimpanzee and human genomes Nature 486 (7404) 527-531. At the moment this genome is available only on the test version of the browser. Scally A, Dutheil JY, Hillier LW et al. 2012 Insights into hominid evolution from the gorilla genome sequence Nature 483 (7388) 169-175. I abhor averages. I like the individual case. —J.D. Brandeis. We focus on the important distinction between confidence intervals, typically used to express uncertainty of a sampling statistic such as the mean and, prediction and tolerance intervals, used to make statements about the next value to be drawn from the population. Confidence intervals provide coverage of a single point—the population mean—with the assurance that the probability of non-coverage is some acceptable value (e.g. 0.05). On the other hand, prediction and tolerance intervals both give information about typical values from the population and the percentage of the population expected to be in the interval. For example, a tolerance interval can be configured to tell us what fraction of sampled values (e.g. 95%) will fall into an interval some fraction of the time (e.g. 95%). Altman, N. & Krzywinski, M. (2018) Points of significance: Predicting with confidence and tolerance Nature Methods 15:843–844. Krzywinski, M. & Altman, N. (2013) Points of significance: Importance of being uncertain. Nature Methods 10:809–810. A 4-day introductory course on genome data parsing and visualization using Circos. Prepared for the Bioinformatics and Genome Analysis course in Institut Pasteur Tunis, Tunis, Tunisia. ▲ Composite of the kinds of images you will learn to make in this course. Data visualization should be informative and, where possible, tasty. Stefan Reuscher from Bioscience and Biotechnology Center at Nagoya University celebrates a publication with a Circos cake. The cake shows an overview of a de-novo assembled genome of a wild rice species Oryza longistaminata. ▲ Circos cake celebrating Reuscher et al. 2018 publication of the Oryza longistaminata genome. Customize the experiment for the setting instead of adjusting the setting to fit a classical design. The presence of constraints in experiments, such as sample size restrictions, awkward blocking or disallowed treatment combinations may make using classical designs very difficult or impossible. Optimal design is a powerful, general purpose alternative for high quality, statistically grounded designs under nonstandard conditions. We discuss two types of optimal designs (D-optimal and I-optimal) and show how it can be applied to a scenario with sample size and blocking constraints. Smucker, B., Krzywinski, M. & Altman, N. (2018) Points of significance: Optimal experimental design Nature Methods 15:599–600. Krzywinski, M., Altman, N. (2014) Points of significance: Two factor designs. Nature Methods 11:1187–1188. Krzywinski, M. & Altman, N. (2014) Points of significance: Analysis of variance (ANOVA) and blocking. Nature Methods 11:699–700. Krzywinski, M. & Altman, N. (2014) Points of significance: Designing comparative experiments. Nature Methods 11:597–598.